Canine Osteoblasts (CnOb) from Cell Applications, Inc. provide an excellent model system for studies relevant to the skeletal system, including mechanisms of cancerogenesis. Develop personalized osteosarcoma treatments by testing Src inhibitor dasatinib, procaspase-3 activating compound PAC-1, HSP90 inhibitor STA‐1474 and STAT3 inhibitor LLL12. 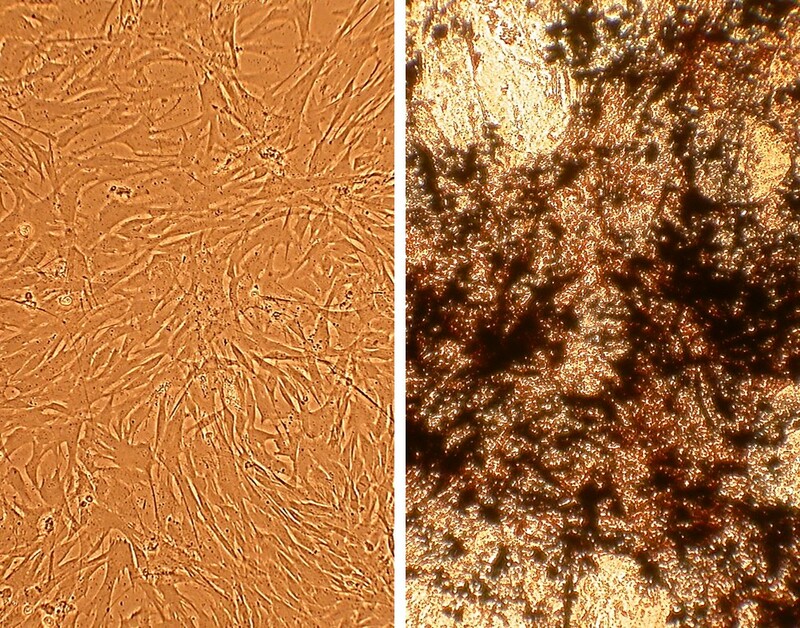 (Click to Enlarge) Canine Osteoblasts, CnOb (L) von Kossa stained (R). Fenger, J., R. Roberts, O. Iwenofu, M. Bear, X. Zhang, J. Couto, J. Modiano, W. Wisseberth and C. London. 2016. MiR-9 is overexpressed in spontaneous canine osteosarcoma and promotes a metastatic phenotype including invasion and migration in osteoblasts and osteosarcoma cell lines. BMC Cancer, 16:784.
de Sá Rodrigues, L., K. Holmes, V. Thompson, C. Piskun, S. Lana, M. Newton and T. Stein. 2015. Osteosarcoma tissues and cell lines from patients with differing serum alkaline phosphatase concentrations display minimal differences in gene expression patterns. DOI: 10.1111/vco.12132. Fenger, J. 2015. Investigating the Biological and Molecular Consequences of MiR-9 Dysregulation in Canine Mast Cell Tumors and Osteosarcoma. PhD Dissertation, Ohio State University. Quintanilha, L., T. Takami, Y. Hirose, K. Fujisawa, Y. Murata, N. Yamamoto, R. Goldenberg, S. Terai and I Sakaida. 2014. Canine mesenchymal stem cells show antioxidant properties against thioacetamide-induced liver injury in vitro and in vivo. Hepatology Res, 44:E206-E217. Couto, J. 2013. Biologic Activity of the Novel Small Molecule STAT3 Inhibitor Against Canine Osteosarcoma Cell Lines. The Ohio State University, M.Sc. dissertation. Davis, L.E., N.E. Hofmann, G. Li, E.T. Huang, M.M. Loriaux, S. Bracha, S.C. Helfand, J.E. Mata, K. Marley, and A. Mansoor. 2013. A case study of personalized therapy for osteosarcoma. Pediatric blood & cancer. 60:1313-1319. Milovancev, M., I. Hilgart-Martiszus, M.J. McNamara, C.P. Goodall, B. Seguin, S. Bracha, and S.I. Wickramasekara. 2013. Comparative analysis of the surface exposed proteome of two canine osteosarcoma cell lines and normal canine osteoblasts. BMC veterinary research. 9:116. Piskun, C.M., and T.J. Stein. 2013. β-Catenin transcriptional activity is minimal in canine osteosarcoma and its targeted inhibition results in minimal changes to cell line behaviour. Vet. & Comp. Oncology: doi: 10.1111/vco.12077. Book, A.P. 2012. Investigating procaspase-3 as a potential therapeutic target in canine osteosarcoma. Master of Science Thesis. University of Illinois. Couto, J.I., M.D. Bear, J. Lin, M. Pennel, S.K. Kulp, W.C. Kisseberth, and C.A. London. 2012. Biologic activity of the novel small molecule STAT3 inhibitor LLL12 against canine osteosarcoma cell lines. BMC veterinary research. 8:244. Fossey, S., M. Bear, W. Kisseberth, M. Pennell, and C. London. 2011. Oncostatin M promotes STAT3 activation, VEGF production, and invasion in osteosarcoma cell lines. BMC cancer. 11:125. McCleese, J. 2011. Investigating the Biological and Biochemical Consequences of Met Function and Dysfunction in Canine Osteosarcoma. PhD Dissertation, The Ohio State University. Fossey, S. 2010. Characterization of STAT3 Activation in Osteosarcoma. PhD Dissertation, Ohio State University. Fossey, S.L., A.T. Liao, J.K. McCleese, M.D. Bear, J. Lin, P.-K. Li, W.C. Kisseberth, and C.A. London. 2009. Characterization of STAT3 activation and expression in canine and human osteosarcoma. BMC cancer. 9:81. McCleese, J.K., M.D. Bear, S.L. Fossey, R.M. Mihalek, K.P. Foley, W. Ying, J. Barsoum, and C.A. London. 2009. The novel HSP90 inhibitor STA‐1474 exhibits biologic activity against osteosarcoma cell lines. Int. J.Cancer. 125:2792-2801.